Narrative: This watercolour painting is attributed to Sawrey Gilpin. Born in 1733, Gilpin was a British Romantic painter who was initially trained by his father. His uncle William was also a noted amateur artist. Sawrey was later apprenticed to Samuel Scott, a marine painter. Gilpin eventually began sketching horses at Covent Gardens near Scott’s studio; he became known for his depictions of animals especially horses. Gilpin often collaborated with other artists including Philip Reinagle, George Barret Senior, and J.M.W. Turner; he added animals to their landscapes and they painted backgrounds for his animals. His paintings hang in the Tate, the Royal Academy in London, the Courtauld Institute of Art, and the Fitzwilliam Museum at Cambridge. Gilpin belongs to the Romantic style of painting; the style arose as a reaction to Enlightenment ideals of reason and order. In his work ‘Philosophical Enquiry into the Origin of Our Ideas of the Sublime and the Beautiful’, Edmund Burke wrote that beauty and the ‘Sublime’ were generated by subjective, emotional responses – an idea that became central to Romanticism. The art that emerged in this period focused on the relationship between man and nature; paintings often contain dramatic skies or shipwrecks. Several Romantic artists portrayed animals in their works often using them as metaphors for human behaviour. This particular painting of Gilpin’s focuses more on the horse as the subject with little background or contextual information. The piece may have been a study for a larger work. Reverend William Gilpin, published an instructive book in 1782 that gave lessons on how to train the eye to compose a ‘picturesque’ painting. To create a ‘picturesque’ composition of a landscape involves changing what is seen in reality to make a softer and more hospitable ideal. Uvedale Price’s ‘Essays on the Picturesqe’, published in 1794, and positioned the concept of the ‘picturesque’ between the beautiful and the sublime. Edmund Burke wrote ‘A Philosopical Inquiry into the Origin of our Ideas of the Sublime and the Beautiful’, published in a few different editions circa 1760. In Canada, throughout the eighteen century and into the nineteenth century, the Garrison society was the British upper class. They had bourgeois values, influenced taste, and provided artists with incomes. They also categorized nature as either ‘picturesque’ or ‘sublime’. 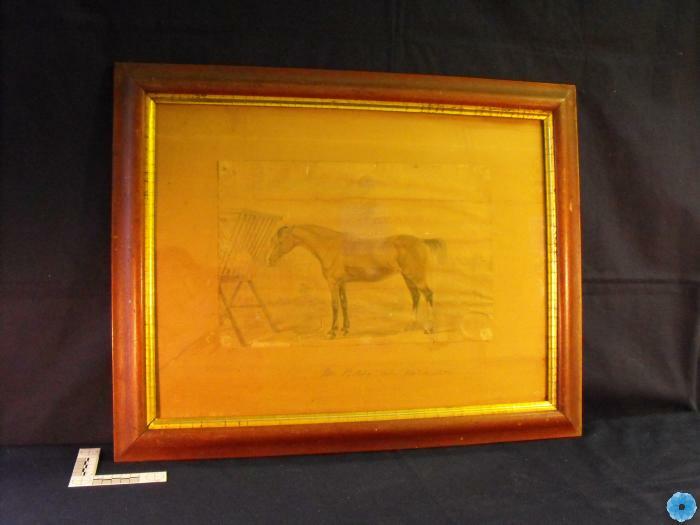 Description: A painting of a horse with a cut mane and tail facing a hay rack with a picket fence in the background. The cut mane/tail was the British style.